Never heard of this before: "No-time bread." Any takers yet? HT Non-stick Ceramic for JLMBBC Bread? Harris Teeter is currently running some kind of promotion in their stores for a line of ceramic dishes with non-stick interiors. I haven't looked closely at them (like at how hot you can get them without f$cking up the coating or the pot itself), and I'm probably not going to buy one just to try it. 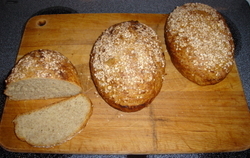 But the lidded ones look like they might be nice for a loaf of JLMBBC bread. Or perhaps the cookware won't be able to tolerate the temperature extremes and will break. If it turns out they work ok, and I find out, I'll post something; or perhaps a Gentle Reader will find out or try, and let us know. Edit: ok, probably not a good idea. I'll go look at them though and see what the signage for them says. I'm going to a party later today, and I asked if I could bring anything; the host requested bread if I had any. Since I needed to make some, and I'd never tried any JLMBBC oatmeal before, I thought I'd give it a shot. Oven, pans, and lids preheated for 30 minutes at 450°F. Morton kosher salt       2 Tb. oatmeal for topping	  6 Tb. I had a little less rise in the bowl than I expected, and a slightly smaller loaf. The dough also seemed drier: I guess the oatmeal soaked up more water than an equivalent weight of flour would. The crumb is also much more even than I expected, which supports the idea that the dough was essentially drier than I was thinking it would be. But that's actually good here, because the bread is to be sliced for sandwiches. About half the oatmeal I dropped on top fell off, but that's fine. The bread tastes nice, with a slightly sweet flavor I usually don't get. There's also a mild sense of sweet spice, like cinnamon or something. I have no idea where that came from. 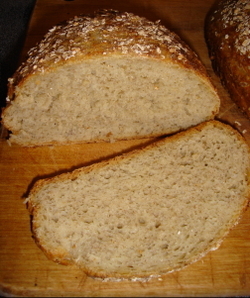 The crumb, as mentioned before, is good for sandwich bread. I think adding some wheat germ would have worked well here. One might notice that my technique has diverged significantly from Lahey's by now. It looks like Lahey gets better rise than I do too. There are some other differences, like he's using 500 degrees instead of 450. In my mind, some of these differences speak not to any errors, but to how robust the recipe is. So, if you haven't done this yet, or have any fear of screwing up, perhaps this short video clip will ease your mind and get you baking. I've now made several 100% durum flour loaves, and they've all been great. The durum flour gives a great golden hue to the bread; it looks like it has eggs in it, even though it doesn't. In fact, the suggestion is so strong that I've thought the bread tasted eggy, even when I knew I'd put no eggs in. The taste difference between using plain flour and durum flour is yummy, but it's subtle, and easily masked by other flavors. I can particularly understand why sesame and semolina is a popular combination, as there are some flavor congruences, but it's still easy to overwhelm the pleasant semolina flavor. Not everyone says you can't make a 100% semolina loaf: Rose Levy Beranbaum has a recipe in her Bread Bible. I can't recall another 100% recipe at the moment, but I believe I've seen others. By the way, the difference between semolina and durum flour is just that the durum flour is ground to the same particle size as regular flour, where semolina flour is coarser, like fine cornmeal. The durum wheat used in both is the same. If you can't find durum flour locally, you can order it in a 3-lb. bag from King Arthur, who also sell a semolina flour separately. I keep trying to come up with a good idea for a "Durham Durum Loaf," playing off the homonyms involved. But I can't figure out what would go in it that would tie it to Durham [well, I can think of some things, but none of them are appropriate :) ]. The loaf on the right was cooked in my usual 3-qt All-Clad casserole. 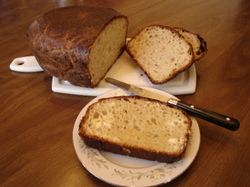 The loaf on the left was cooked in a similarly-sized enameled cast-iron pan of unknown provenance. The All-Clad loaf cooked pretty much like they always do. 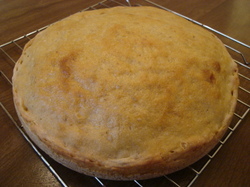 The other loaf was taller and much more of a ball -- almost perfectly shaped, in my opinion. The cracks on top of it were gorgeous. (One can induce cracks by slashing loaves before or during baking, but I usually don't think of it.) However, as has happened to both a commenter here and I, the loaf stuck like crazy. It took me about 10 or 15 minutes to get it out without seriously damaging it, and I bent up a small offset spatula doing so. I made sure the pan was scrupulously clean, because I thought some water spots might have caused my last problem, but I guess that didn't have anything to do with it. I'd really like to figure that out. It only happens when I use enameled cast iron. But the taste was gorgeous. I measured everything by weight this time and wrote it down. I'll even put in product information (except for the flax seed, as I used the last of it and threw the bag away). Water percentage is pretty high (100%, unless you count all the flours together, in which case water comes out at about 88%). Cooking was pretty much standard: oven and cooking vessels pre-heated at 450 Fahrenheit for 30 minutes; dough divided evenly between the pots; cooked 30 minutes covered, 30 minutes uncovered; loaves cooled on rack. The rye flour adds a little flavor, but also gives some moistness; at a much higher percentage, the loaf would start to seem gummy. Another one of my small problems (and we should all have such problems) is that I won't stop playing with the recipe. How much water can I get in it? How salty do I like it? Should I add some rye flour, or bean flour, or flax seed? Should I try sweetening it? (Haven't done that one yet.) Yesterday's bread-making session was another whole wheat blend: lots of people have been asking me lately how much whole wheat flour they can use, so I was spurred to try a WW loaf again. I made two loaves, using 1/3 bread flour, 1/3 traditional whole wheat flour, and 1/3 King Arthur white whole wheat flour. I added a couple of tablespoons of chickpea flour to the mix, along with the usual amounts of everything else. I also tried to see how much water I could get in, and wound up with a rather wet dough that left a tablespoon or two of water in the bottom of the mixing bowl. I baked them in my favorite baking container for these loaves, a rather non-traditional 3-quart All-Clad casserole. Oven and baking utensils were preheated the usual 30 minutes at 450 degrees F.
I got good rise in the bowl -- enough that I got scared and moved some of the dough to a second bowl. I stirred it down before I went to bed, then fired off the oven when I got up the next day, and put the bread in when the oven was ready. Since the dough was rather wet, I increased baking time by 10%: 33 minutes covered, 33 minutes uncovered. It looked done and smelled done after that, so I pulled it out. I've started letting the bread cool for 5 minutes before trying to take it out of the pans, like with a cake: I get a little bit of shrinkage as the bread cools, and it comes out more easily, but I imagine I'm sacrificing some crust crispiness. Ok, but not great. It was a little too whole-wheaty tasting for me. I think this mix would be a good candidate for trying to sweeten. It was a little wet too, despite the extra baking time. By the way, that extra tablespoon or two of frank water made extra-brown, extra-crispy regions appear on the bottom of the bread. But it still seemed done, until I got all the way to the center of the loaf: I found a region maybe the size of an old-style silver dollar where the bread could have used some more baking. Close though -- certainly close enough to eat. I can certainly see the advantages to being really OC about this process -- measuring closely, following recipes exactly -- but I guess I'm a little too easily bored to do that. I envy people like Rose Levy Beranbaum, who work out exactly what to do and stick to it, or at least keep up with their changes to the point where they know what they did. Me, I'm too slap-dash and easily bored. I don't really even measure water for this bread anymore: I just add water until it looks like I want it. But hey, live and learn, right? Ah, sweet notoriety. :) No link though, which might be good, as it might have swamped my bandwidth allocation. It's kind of hard to tell from the pictures what the shape of these really is, but football or foot-boule comes as close as anything else. BTW, these were bread flour with small amounts of bean flour (1 Tb.) and wheat germ (3 Tb.). Awfully dark again. I think my oven may be dying. Yay. Todays JLMBBC project was a boule using King Arthur's new White Whole Wheat flour in a 1/1 ratio with their regular bread flour. I also increased the flour and water slightly: I used 450 grams of flour rather than three cups (which probably weighed out to about 430 grams), and a corresponding increase in water. 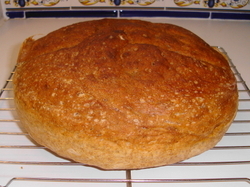 Salt was 2 teaspoons of store brand iodized, and I used the typical 1/4 teaspoon yeast. I treated the dough very gently after its last stirdown. Cooking time was 30 minutes covered, 30 uncovered in a 450 degree oven (I actually preheated pot and oven to 500, then turned it down when I put the bread in). I used my 3-quart All-Clad casserole, which (along with their 3-quart saucepan) is what I've used to bake most of these JLMBBC loaves. The obvious difference is I got a much darker loaf. The white whole wheat I was using in part is not particularly dark, and the baking time was very close to other baking times, so I can only assume that there's a lot more sugars in the new flour. Another difference is that the loaf is significantly taller -- much more so that can be explained by the 5% increase in the amount of flour. I think my previous loaves have been stirred down too vigorously too close to the baking time. 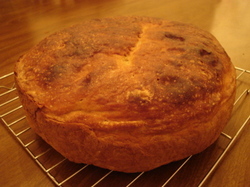 There's also a slight, unobjectionable bitterness, which is either the flour or the loaf's being much darker. I'd give this loaf an 8.5. This is my second JLMBBC experiment using sourdough starter. The whole idea of a long rise coupled with small amounts of leavening sounds like a natural for sourdough. Unfortunately, I made a few mistakes with my first loaf. 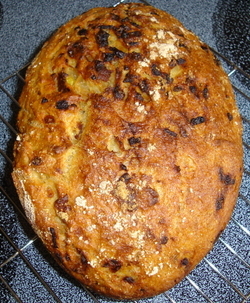 This is the second try; one of a batch of two loaves. Weight is about 1.25 pounds. It looks a lot like the bread from earlier in the week, but it's actually lighter colored, even after a few additional minutes in the oven. It's also smaller. I may have overrisen it: I used both regular yeast and some sourdough started, and I was just winging the whole process, so I wanted to make sure there was plenty of leaven. There was. In fact, I had to stir it down repeatedly. The last time I stirred it down, I noticed some frank liquid in the bowl that hadn't been there before. 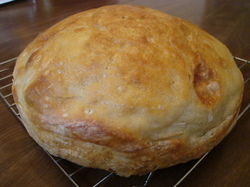 But the loaf is ok, even if it is smaller and paler than its cousins from earlier in the week. It's got a nicely sour flavor to it and seems a little wet, like a lot of sourdoughs I've had. So, we still need some work, but it's not a bad Xmas present overall. JLMBBC: An acronym for the Jim Lahey/Mark Bittman Bread Club, which is my term for folks interested in baking a style of bread developed by Mr. Lahey at his Sullivan Street Bakery; popularized by Mr. Bittman via his NYT columns.